Back in 2009, residents were puzzled to see a new construction emerge on the skyline, at the Westway Sports Centre. Was it part of a film set, or a sports project? Surely it was only temporary? It turned out to be the first of two advertising towers, aimed at motorists on Westway and rising 100 feet into the air. Illuminated adverts 25 feet high swiftly appeared, and have been with us ever since. 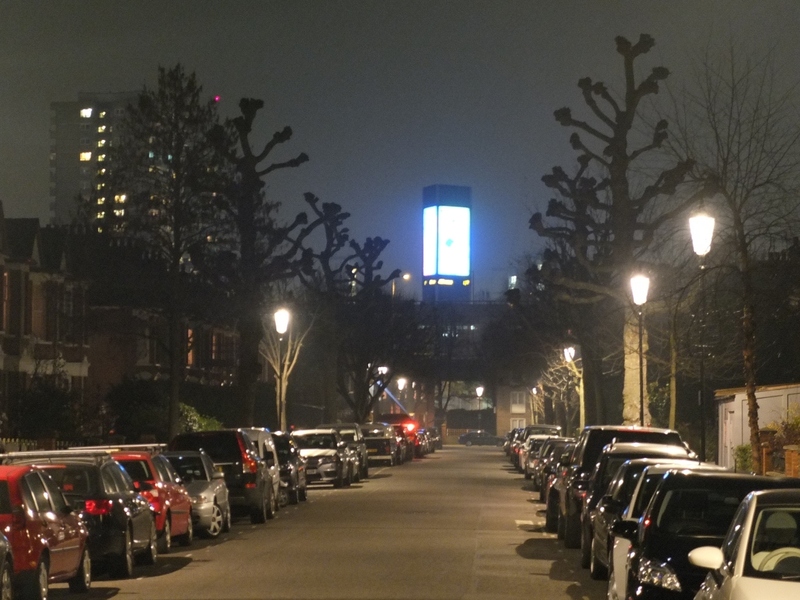 At night they dominate the southern skyline for the full length of Highlever Road and light up the bedrooms of houses and flats on Oxford Gardens. Swiftly nicknamed the ‘Towers of Terror’ a local campaign got underway to get lobby for these adverts to be removed. It emerged that the Westway Development Trust had leased small plots of land to JC Decaux, the outdoor advertising company. It also emerged that Kensington & Chelsea had refused planning permission, but this decision had been overturned by the Planning Inspectorate (based in Bristol). While it seemed extraordinary that a Planning Inspector had approved such a structure on the edge of a conservation area, the decision was made and nothing could be done. Only a handful of residents in Oxford Gardens had received any notification of the original planning application, or the appeal. And such notifications that were sent out by the council made no mention of the height and scale of these structures. Hence only a couple of objections were submitted. Most residents had no idea of what was coming. Westway Development Trust chief executive Martyn Freeman was memorably confronted by a mother, at a packed meeting at St Helens Church Hall, who asked how he would like it if his young daughters went to bed and awoke to the sight of an illuminated David Beckham, 25 feet high and in his underpants, gazing into their bedroom. Martyn Freeman’s explanation that the Trust needed the income from advertising to support its activities did not convince. We have never been told what sums are involved, despite repeated requests. And the Trust is a charitable body, managing public amenity land for the benefit of Londoners. It does not have the excuse that it is a commercial landlord. After a long campaign by the Association, the council gave written undertakings that ‘discontinuance action’ would be taken on the advertisements, once their initial five year approval had expired. This felt a long time to wait, but gave some prospect of relief from this blight on the neighbourhood. The five years expired in May 2013. Since then, the Association has regularly reminded the council of its commitment to halt the display of the adverts. We have been given various reasons why such a decision will take time to make, and are now told that the matter will be decided by the council’s Planning Applications Committee, some time after the May 2014 local elections. This will make it 6 years of waiting. We have asked to make an input to the committee report, and the material we have sent is at this link WESTWAY ADVERTISING TOWERS – input from SHRA to PAC report.final. We will keep local residents informed of the date of the committee discussion, which will not be before June, and hope to see plenty of you there for the occasion. This entry was posted in Uncategorized by secretary. Bookmark the permalink. I wonder if you are aware of the efforts to get a Parliamentary debate on the tall buildings which are springing up all over London. I am aware that your organisation has signed the Statement in the Guardian calling for Commission but would urge your organisation and its members to also sign the petition calling for a debate. Only by rasing the profile of the discussion can we hope to succeed. Yes, we have now signed the petition and thanks for altering us to this.